Held on Wednesday 21 March at 09:30, join James Illsley, portfolio manager, for an update on his Fund’s low cost, low active risk approach. 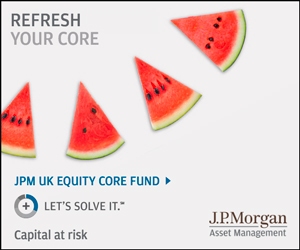 Having achieved yet another 12 months of outperformance, James Illsley, portfolio manager, will give an update on the JPM UK Equity Core Fund. Our innovative Fund’s low cost, low active risk approach aims to produce consistent returns from the UK stock market by taking many small active stock positions, while reducing risk at the sector level. As at the end of February, the fund has achieved 72 months of outperformance of the FTSE All-Share Index on a rolling 3-year basis*. Source: J.P. Morgan Asset Management as at 28 February 2018. Fund performance is based on NAV of the share class E (inc), timing adjusted in GBP with income (gross) reinvested including ongoing charges, excluding any entry and exit fees. *From inception on 31 March 2009, 3 year rolling returns with monthly step. Provides indicative returns that account for the timing difference between pricing of the pooled fund and its benchmark index. Past performance is not a reliable indicator of current and future results. You will need to have a BrightTALK account to access the webconference. Registration is free. Can't attend live? An online replay will be available shortly after the live broadcast has finished. Investment objective: The Fund aims to provide capital growth and outperform the FTSE™ All-Share Index over the long term by investing primarily in a portfolio of UK companies. Risk profile: The value of Equity and Equity-Linked Securities may fluctuate in response to the performance of individual companies and general market conditions. The single market in which the Fund primarily invests, in this case the UK, may be subject to particular political and economic risks and, as a result, the Fund may be more volatile than more broadly diversified funds. For Professional Clients only – not for Retail use or distribution. James Illsley is a portfolio manager of the JPM UK Equity Core Fund and the JPM UK Equity Plus Fund within J.P. Morgan Asset Management's UK Equity team.